Apple Graphics does wall and window graphics, which are a great way to improve the appearance of a room or a store. The wall graphics are a matte vinyl, so it appears as if they were actually painted on the wall or a door. 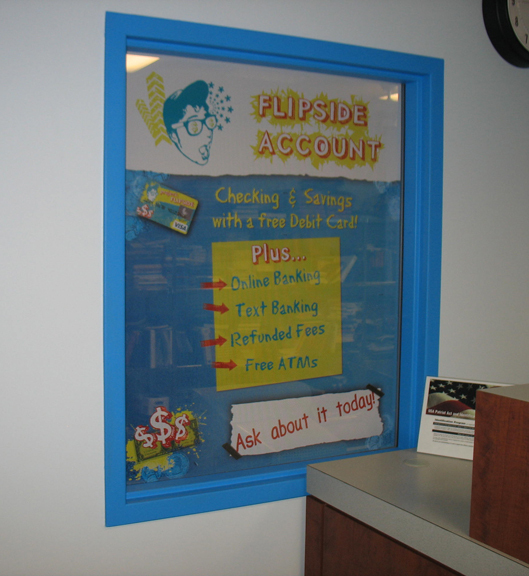 Window graphics are a perforated view-through vinyl, so you can still see through the window on the opposite side. Apple Graphics did a vehicle wrap for Bucks First Federal Credit Union and its Project Flipside a few months ago. Since the wrap was such a success, they contacted us again to design and install graphics for their new branch at Palisades High School. The wall and window graphics were designed very similar to the vehicle wrap, so the marketing campaign remained uniform. Project Flipside's graphics are bright, unique, and will grab everyone's attention. 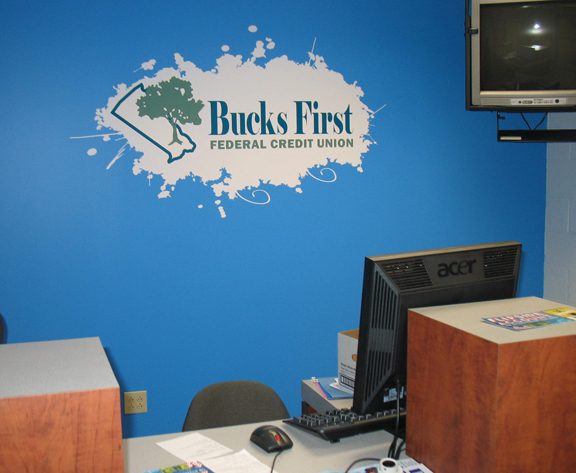 Apple Graphics installed a wall vinyl die-cut logo for Bucks First, which can be seen on the wall behind the teller's desk. 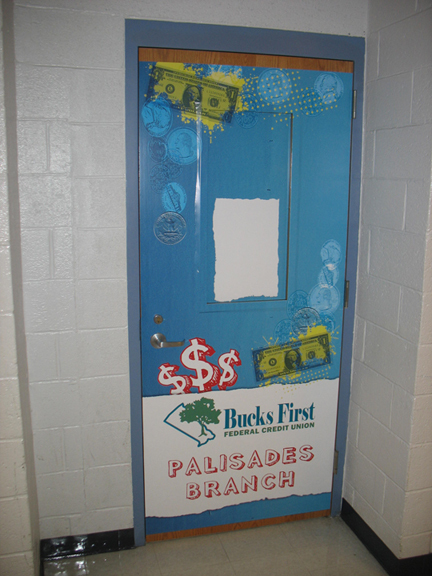 First Bucks also had us install a vinyl door wrap to both sides of the entrance door, so the students could clearly identify it. Finally, we installed a view-through window wrap so the classroom next door couldn't see through into the branch. Apple Graphics is very happy with the continuous work we have got from First Bucks Federal Credit Union. And it all started with our Project Flipside vehicle wrap!